Gummybear International Releases Newest Gummibär Single, Bubble Up - Gummybear International Inc.
Last week Gummybear International made the latest Gummibär single “Bubble Up” available for purchase world-wide. The song itself can be purchased for $0.99 or fans can buy the entire single, which includes 3 versions of the song for $1.99: the video version, a radio edit and an extended club mix. Currently only available on iTunes and on the official Gummibär website at http://www.gummibar.net, “Bubble Up” is expected to be made available on Amazon.com and other digital music outlets later this month. 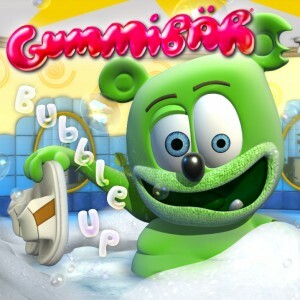 “Bubble Up” is the featured song in Gummibär’s latest YouTube video of the same name, which premiered world-wide over Easter weekend. The video collected well over 100,000 views in its first week and marks the first new recording from the gummy bear character in 2 years. The first Gummibär videos were posted in 2007 and since then the character has grown to be immensely popular around the world. The official YouTube channel for Gummibär (http://www.youtube.com/gummybearintl) today has over 1.5 billion documented views and continues to average about 2 million views every day. The Gummibär YouTube channel also ranks as the 27th most viewed musician of all-time and is the 67th most viewed channel of all-time. The success of Gummibär extends outside of YouTube too. The character’s songs have been released in over 40 different countries and in over 27 different languages. Gummibär has received Sales Certification Awards in over 8 countries, including one for going 96 times Platinum on Universal Records in Greece with its premier album “I Am A Gummybear,” despite the country’s adverse economic conditions. The musical success of Gummibär has also lead to extensive merchandising lines throughout the world, including very popular ones in Greece, Poland and France. About Gummybear International – Gummybear International is engaged in the creation, development, and branding of animated entertainment properties, as well as musical content based on and produced for such properties. It markets and sells recorded musical and video products in various physical formats, such as compact discs and DVDs, and digital formats, such as downloads and ringtones, through a worldwide network of established distributors and licensees. The company’s music publishing segment owns and acquires rights to musical compositions, markets these compositions, and receives royalties or fees for their use. It also is actively developing mobile and computer based games and exploiting merchandising rights for its brands in cooperation with a variety of licensing partners. GBI is working on a number of film and TV projects. The company is headquartered in New Jersey. Trop génial le nouveau tube de Gummibar nommée (Bubble Up) ! I love you Gummibar ! I love your new single Gummibar ! I just love this music! !